The BOC convenes for an important rate decision which also consists of new forecasts and a press conference. Canadian policymakers can be pleased with NAFTA progress, oil, and jobs but not all is rosy. 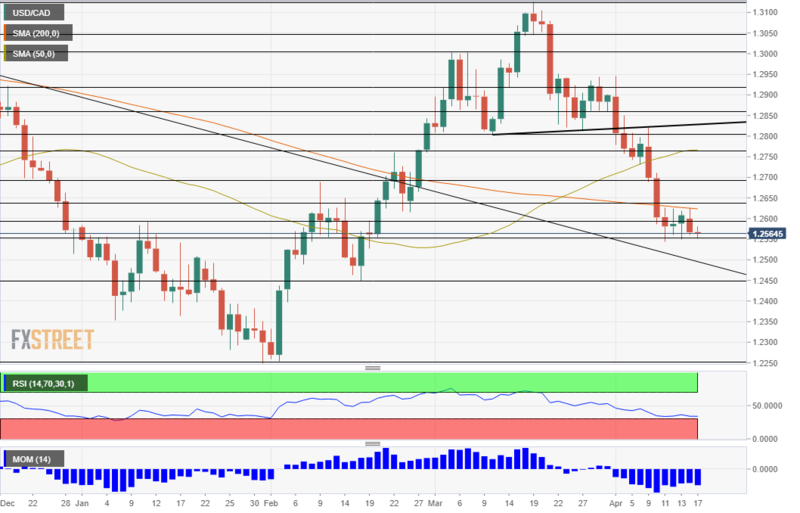 The USD/CAD is apparently in a downtrend, but close to oversold territory. The Bank of Canada is likely to leave the interest rate unchanged at 1.25%, but they are quite likely to move markets. The event on April 18th at 14:00 GMT consists of new forecasts and a press conference by Governor Stephen Poloz and Deputy Carolyn Wilkins from 15:15 GMT. The Ottawa-based institution has many things to consider. 1) NAFTA: In the previous rate decision and in the consequent public appearances, Poloz expressed concern about the fate of the North American Free Trade Agreement. Canada is very dependent on trade with the US and it was “hard to imagine” a world without NAFTA. Uncertainty about the future was a recurring theme and may be tackled first and foremost. And here, there seems to be a lot of progress. The US has abandoned its demand for 50% American content as a requirement for NAFTA cars, opening the door to a lot of development. While the US focuses on China, NAFTA negotiators and also Canadian PM Justin Trudeau expressed optimism about getting a deal. An agreement seems hard to reach before the Mexican Presidential elections campaign begins in May, but confidence from politicians could undoubtedly turn into optimism from the central bank. 2) Oil prices: The tensions around Syria sent oil prices to the highest levels since 2014. Yet Canada’s principal export is also enjoying more favorable fundamentals. Supply is not catching up with demand and inventories are seeing withdrawals. OPEC and non-OPEC are keen to continue their production cut partnership for an extended period, also supporting higher crude prices. This is good news for Canada even though output from tar sands is stagnant. 3) The labor market: After seeing leaps in November and December and a downfall in January, Canadian employment returned to healthy growth in February and March. The increase of 32,300 positions last month is encouraging. Wage growth also looks healthy. 4) Rising inflation: We will get updated inflation data for March on Friday, but the data for February is encouraging. Headline inflation is up 2.2% as of that month, and Core CPI is at 1.5%. Both are increases. Other measures of core inflation, the Trimmed Mean, Common, and Median CPI are all moving to the upside. This is far from being out of control, but the BOC may lean towards raising rates to curb inflation rather than the other direction. Not all is rosy in Canada. Apart from no final signing of NAFTA, prices of homes in Toronto are falling, raising worries about the housing market in general. In addition, the economy shrank in January by 0.1%. This is probably a one-off, but still of concerns. Nevertheless, since the last rate decision, we are seeing fewer clouds over NAFTA and healthy growth in jobs, inflation, and also oil prices. 1) Ongoing hawkish bias: The Bank of Canada already had a hawkish bias in March despite serious concerns about the future of trade relations and before the recent upbeat data. These four positive developments will almost certainly keep the Bank on track with its upside tendencies. This scenario has the highest probability. 2) Rate hike now: Can they surprise markets and raise rates at this April meeting? Yes. Contrary to the Fed that telegraphs its intentions well in advance, the BOC can and sometimes wants to surprise markets. Last year, Poloz was critical of forward guidance and implied that surprising markets is not such a bad thing. If the BOC raises rates to 1.50%, it will come as a surprise and the C$ is set to shoot higher. This move has a low probability at this juncture as they may want to wait for a final NAFTA deal. 3) Hike next time: The BOC could take a middle-ground between simply maintaining the bullish bias and increasing the interest rates right now: it could say that rates will rise next time. However, as mentioned earlier, such forward guidance is not the BOC’s way of doing business. The BOC could also surprise to the downside and shift to a neutral bias, leaning on ongoing trade uncertainty. However, this would be an even greater shock and is highly unlikely. The USD/CAD is trading in a downtrend which can undoubtedly be seen with one look at the graph. The pair is trading below both the 50-day and 200-day Simple Moving Average and has accelerated its losses after falling below uptrend support early in the month. Momentum leans heavily to the downside and the RSI is also lower. However, it is getting closer to 30, oversold territory. Immediate support is at C$1.2555, the April low. Further down, 1.2450 was a low point in February. The 1.2250 level was the low point of the year. Looking up, 1.2630 capped the pair in mid-April and works as immediate resistance. 1.2680 was a swing high in early February and 1.2760 was another such high later on.